Grey seal pup carries hope for the next generation. It seems we have a distemper tantrum. Last month, the National Oceanic and Atmospheric Administration (NOAA) declared an Unusual Mortality Event (UME) for pinnipeds. Pinnipeds are a group of aquatic mammals that include seals, which are the species affected by this recent UME. Under the Marine Mammal Protection Act, a UME is defined as a “stranding event that is unexpected, involves a significant die-off of any marine mammal population and demands immediate response.” Over the last few months, the number of stranded (live and dead) seals has been regionally significant. 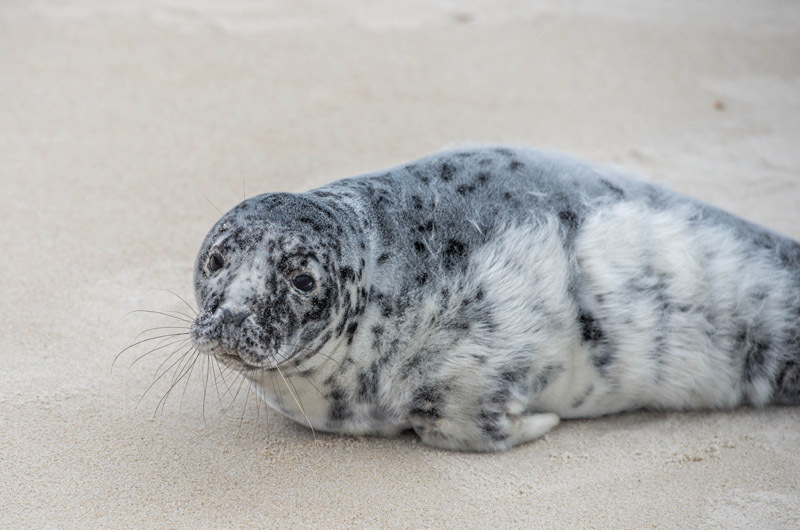 Since July, there have been 1,036 seals reported stranded along the New England coast. Just over 750 seal illnesses and deaths were recorded in Maine, 110 in New Hampshire and 171 in Massachusetts. 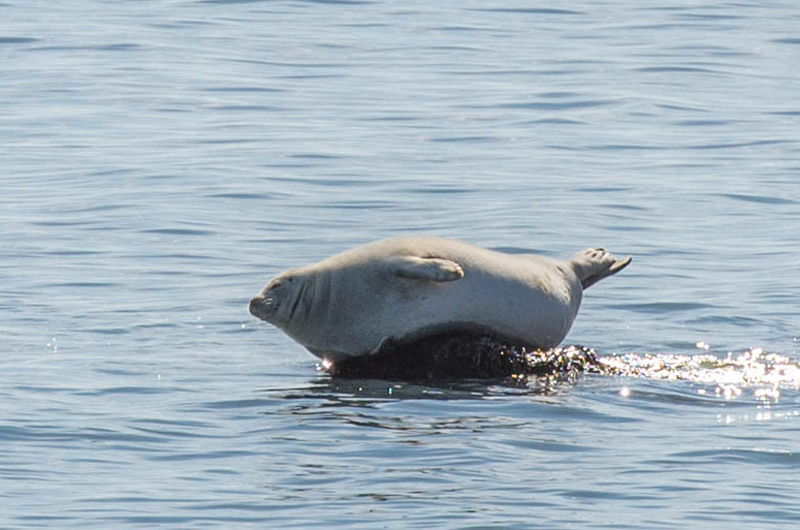 The most common seal species affected has been harbor seals, though some grey seals have also been involved. Scientists believe that the source of the die-off is phocine distemper virus, though they also found some seals that tested positive for avian influenza, which isn’t suspected to have directly caused the mortalities. Phocine distemper virus is a type of morbillivirus, the genus of viruses that include the familiar measles virus in humans, canine distemper in dogs, coyotes and wolves, rinderpest in cattle and peste-des-petit-ruminants in sheep and goats. For seals found alive, symptoms of distemper include lethargy, coughing and sneezing, discharge from the eyes and nose, seizures, skin abscesses and poor body condition. Death can result from this virus and its effects, since it also suppresses the immune system, making the animals more susceptible to other infections and diseases. Luckily, phocine distemper is not zoonotic, meaning it cannot be transferred to humans. However, dogs might be receptive, so for all those beach dog walkers, remember to keep your dog leashed or at least away from injured or dead seals. It also cannot be transferred to fish, so consumption of those bass and blues is not restricted. This most recent outbreak is not the first time that seals have faced this epidemic. Phocine distemper was found on this side of the Atlantic in seals off Long Island, N.Y. in 1992, and in 2006 and 2007, the east coast population of seals lost about 1,500 animals to distemper. The disease is spread through inhalation and direct contact between seals. Mortalities can be significant. A large outbreak off the northern European coast killed 20,000 animals or 60 per cent of the population in the affected area in 1998; and 30,000 seals died in an outbreak in the Baltic, North and Wadden Seas in 2002. Although Benjamin Franklin insisted that one not “go to the doctor with every distemper, nor to the lawyer with every quarrel, nor to the pot for every thirst,” you might be the first to find a sick or dead animal and should be the first to call NOAA about it. Furthermore, if you see a seal on the beach, remember not to get too close; and that applies even if the seal is healthy.